While dozens of students and staff have claimed sightings, the only confirmed encounter took place yesterday in the band room, when the squirrel, apparently roused into a martial state by a student’s drumming, charged from an instrument locker, punctured the bass drum with his bayonet, emitted a high, rebellious screech, and retreated to high ground by way of an air duct. Later in the day, a careful search of the music classrooms uncovered the squirrel’s visitor’s badge, along with his cap and woolen trousers, stuffed into the bell of a baritone saxophone. A review of the atrium’s security camera footage from the past several days showed the squirrel engaged in drills, practicing basic pincer movements in the predawn hours. 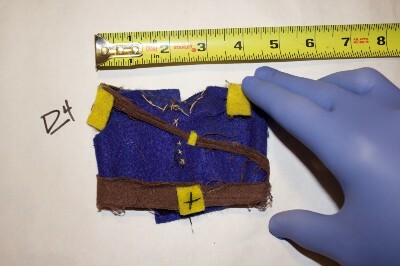 Evidence collected from the battlefield included portions of a Union guinea pig’s uniform. Insignia badges (not pictured) indicate the rank of captain.